If for no other reason, it could be worth watching the PBS Ken Burns extravaganza on the US war on Viet Nam just to see how many hours and how much video imagery can be spent rehashing what establishment accounts have already been foisting on the public for decades. No doubt about it, Burns, PBS and NPR are masters of what they do. They jump all over showering the viewer with imagery, factoids and interviews to make it seem like a wide range of incisive questions are being raised and all viewpoints are being aired. Rather than a basis for historical analysis, however, it's little more than ambiguity, equivocation, obfuscation and contradiction carefully kept within established parameters about US good intentions, innocent cultural misunderstanding, communist evil deeds, and sympathy for any US collaborators who were less murderous and corrupt than its first chosen partner Ngo Dinh Diem--in short, anything but the possibility that the US consciously instigated the war to maintain and expand its power in Asia. Lying by omission is a standard political strategy, but PBS is not going to give naysayers an equivalent 18 hours to fill in what was left out. All we can hope for is getting a few words in edgewise. 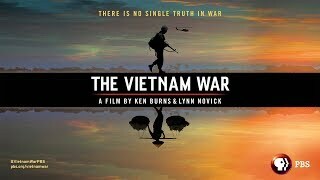 (For some specifics see http://vietnamfulldisclosure.org/index.php/burns-novick-documentary-brief-first-thoughts-episode-1/ ) Thus, my focus here will be on veterans. One NPR commentator recently stated that many veterans may not watch the series because according to some "research," they will recall how unpleasantly they were treated when they got home. This idea of vicious or continuous attacks on returning veterans has been refuted many times. Veterans would be better advised to recall how their government treated them. More likely they do not want to watch and be reminded of how what they were told was at such variance with what they experienced. Secondly, experiencing war violence as a defender of one's homeland is different from experiencing it as an invader. Of course, US GIs (and ARVN soldiers) were told that they were defenders--defenders of freedom against aggressive communists. Nevertheless, even if they were convinced, it would be very different from the experience of Vietnamese fighters who were literally defending their villages and family members from foreign invasion. Veterans do need healing but there are few good options. They may feel better if they can be convinced that the terrible things that they did and saw were necessary, or even if unnecessary, were done in good faith. This is what they are likely to get from Ken Burns, but it is tantamount to embracing the rationalizations of their oppressors--the very ones who drafted them and lied to them--vs. confronting the violence and evil that they were forced to be part of as well as confronting those who planned and orchestrated it. The real terrorists live in Washington D.C. and wear 3-piece suits and wing-tip shoes, not black pajamas and sandals made from car tires. For recent US wars, we now have the Support the Troops campaign, to avoid the past abuse supposedly suffered by returning vets at the hands of disrespectful war protestors. I suspect the real purpose is simply to suppress dissent. Toward the end of the VN war US soldiers like me were quite in agreement with the protestors if not ahead of them; hence the so-called "soldiers' revolt." In any case, today's Support the Troops movement forces vets and the public to suppress criticism of US wars by making criticism of war tantamount to criticism of vets or making support for vets tantamount to support for wars. Lastly, apology could certainly hasten healing, not only to veterans and their families but also to the Vietnamese people as well, but it has not been forthcoming. War makers have learned a lot from and since the VN war. They have learned that hiring mercenaries like the Kurds or turning cities into piles of concrete rubble from the air is preferable to American corpses coming back home in boxes to Pleasantville, America. What the entire nation needs--civilians as much as vets--is a critical analysis of the history and cause of the war. Reporting vaguely that there were differences of opinion about the war among Vietnamese or Americans in the style of PBS pabulum is not the same as critically assessing the origins and motivations of those who initiated these policies and sent soldiers off to kill and die. The Kennedy who escalated the war by sending special forces troops to Vietnam to engage in covert warfare in May 1961 was the same Kennedy who authorized the Bay of Pigs invasion of the previous April. This tells us something, things that we won't get from politicians' speeches or press conferences"or most likely from PBS either. These days presidents and their children do not go off to war. They are busy pursuing careers at Harvard or whatever. They will not ask the hard questions, not just about the VN war but about the patterns of US history from the Native American genocide to slavery to carpet bombing in Korea and Southeast Asia to drone killings in the Middle East. That will be up to the rest of us. When Is Diversity Not Diversity?